I've always liked lists. In fact, I often yank out a fresh piece of paper and write one down during idle time or just for fun. However, my to-do list has definitely changed since having Luke. I used to be able to cruise through it, checking things off right and left. But, now, that doesn't happen. Tasks get interrupted, Luke doesn't nap for a long time, we go out instead of stay in, Josh takes the car for the day, etc, etc. This was definitely a major adjustment for me--some days I would just feel so defeated at the end of the day when I looked at all my unchecked tasks. Or, on the days that had more tasks checked off, I would realize that I was more focused on doing than focused on just being with and enjoying Luke. So, I had to take a new approach. I had to rethink how I was managing my day. Lately, I've been choosing one thing that I really want to accomplish that day. One day, it may be to do the dishes. Another day might be to pick up diapers for Luke. I only choose a task that is doable and realistic. 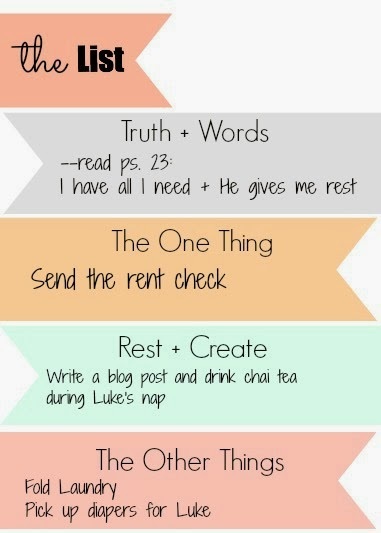 I've also been more intentional about building in rest, creativity, and the Word into my day. I've learned over and over these past few months that a little bit of rest, creative time, and the Word are essential for my day. Without them, I feel used up or in a rut. 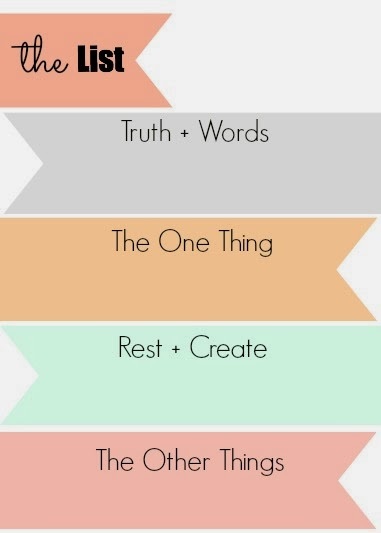 Making a list like this helps me let go of focusing too much on all the things and instead hold onto what I actually want my day to look like. To print this, you can copy this image to your desktop and print it. You can get four to a page if you adjust your print setting to print 4 per page. If that doesn't make sense or if it doesn't work for you, let me know, and I'll see what I can do. This is too cute! Thanks for making a version for us to enjoy! So encouraging. I'm printing mine pronto. Saw someone posted this on instagram today...and ran right over to read the post...I know EXACTLY what you're feeling...I love this approach to a daily tasks list...can't wait to implement it and to see how it works out...THANX! !